UIC has reached about 44 percent of its goal so far for its IGNITE Campaign, which aims to raise $750 million to benefit UIC. More than 26,241 donors have made gifts to the campaign — totaling $330 million as of March 30 in gifts, grants and pledges. The campaign will continue through 2022. 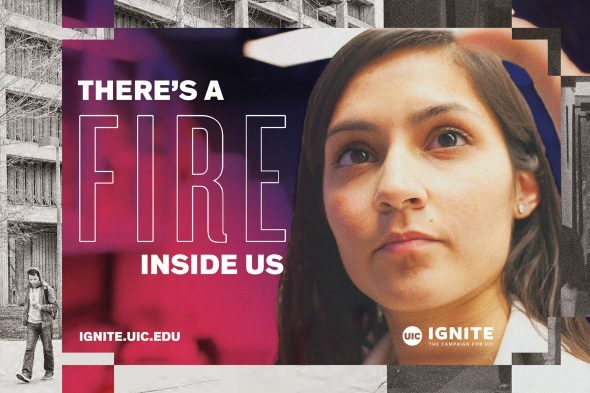 “Both our long-standing values and our ambition is reflected in the IGNITE Campaign,” UIC Chancellor Michael Amiridis wrote to alumni and friends in a campaign update email. The IGNITE campaign aims to raise funds for student scholarships, endowed faculty positions, research and teaching technologies and improved campus facilities. Gifts will also fund research in key areas of excellence — such as the human brain, social disparities, urban infrastructure, and functional and regenerative materials — and develop programs and partnerships to advance global health. Recent gifts include a pledge of $1 million from alumna Jane Sherman to endow a professorship in the College of Nursing; funding for a Polish studies collection from alumnus Richard Nowak; and gifts for the James P. Gleeson Scholarship Fund, named in honor of recently retired Jane Addams College of Social Work professor James Gleeson, which will provide financial assistance for social work students.